Tsar Alexander III gave order in 1891 to start construction of the Siberian railway from Vladivostok on the Pacific westward and from Chelyalbinsk eastward. 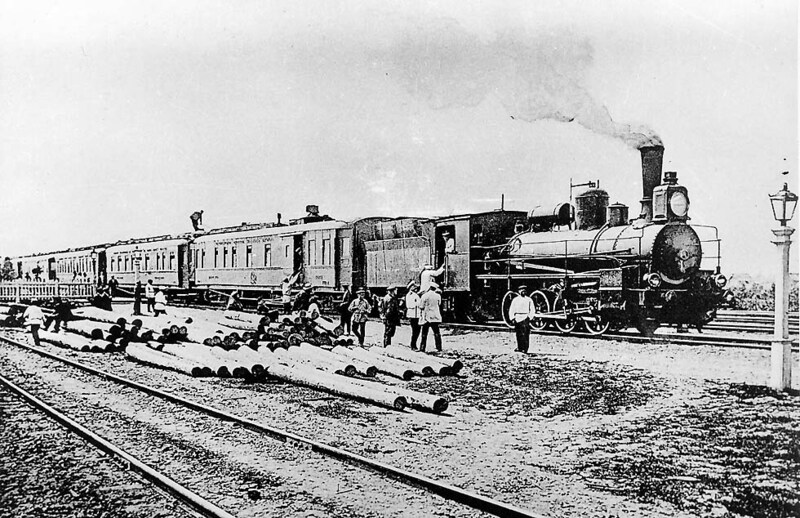 In 1896 a secret Russian - Chinese treaty allowed Russia to build the broad-gauge East Chinese Railway. It was the result of initiatives by the Russian minister Sergey J. Witte and the Chinese politician Li-Hung-Chan. In 1897 Russia occupied Port Arthur and then the East Chinese Railway was extended to the new harbor Dalian. With the Japanese attack in 1904 Russia lost this South Manchuria region. In 1898 the Siberian railway reached Irkutsk and in 1900 a line east of Lake Baikal to Sretensk was completed. 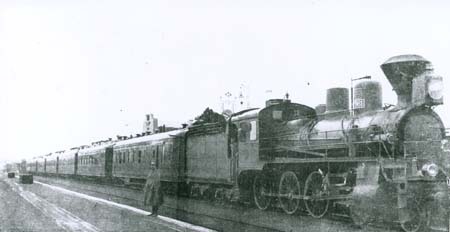 Initiated by Prince Chilkov, on March 20, 1898 (dates according to a contemporary Revue Generale des Chemins de fer) the first express Moscow - Omsk started, known as the State train. Nagelmackers' CIWL had learned from the project and tried to get an exclusive contract. But CIWL only was allowed to contribute one of the four train sets. After an official inauguration with rented state-owned cars, its "International", as it became known, started services from Moscow Kurski station to Tomsk via Tula-Samara on August 20, 1898. 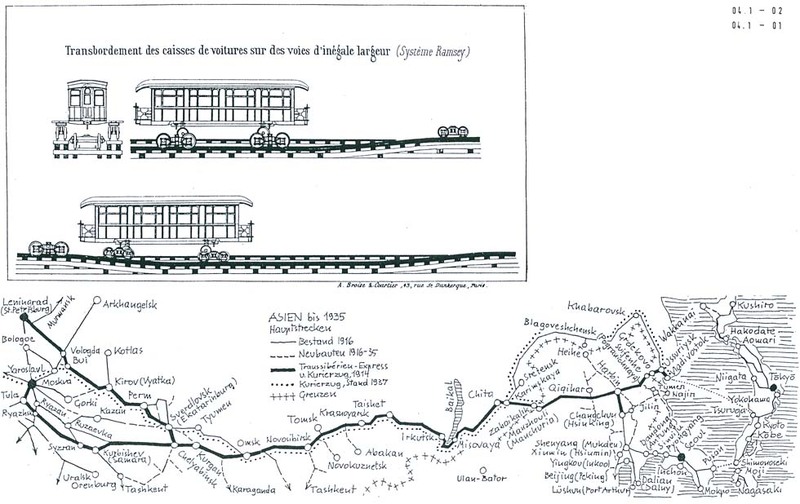 From May 1899 the State Train and from June 17 CIWL's Siberien-Expess ran to Irkutsk and from October 1903 to Baikal. During the Russo-Japanese war, the line on the shores of Lake Baikal urgently was completed. As a result of the war, Japan now controlled the railways south of Changchun and rebuilt them into standard gauge. 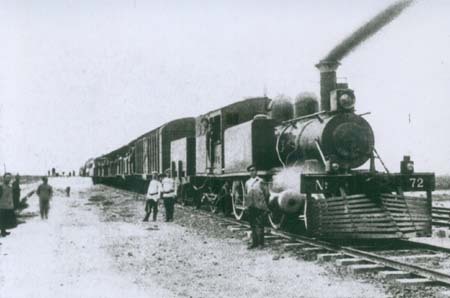 In 1906 or 07 Russia started a state-owned and a CIWL Transsiberien-Express Irkutsk - Vladivostok via the remaining broad-gauge Manchuria, with ship connection to Tsuruga, Japan. A connecting express Tsuruga – Tokyo started in 1912. 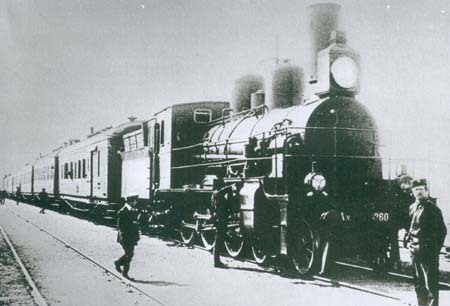 In 1910 the Transsiberien-Express got a branch to Changchun. Finally, from 13 May 1914 CIWL's Transsiberien-Express ran from Moscow to Vladivostok and Changchun without change of train at Irkutsk. 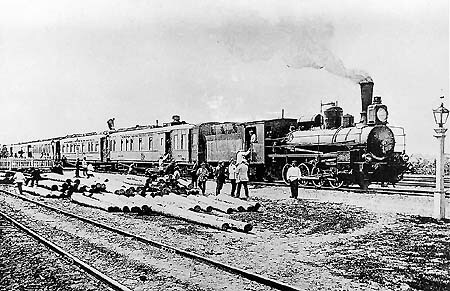 In April23, 1913 the train has derailed between Serpoukov and Tula, south of Moscow, whereupon rumors of sabotage against the CIWL company arose. The Russian state did not want a CIWL monopoly, but the company intended to get dominance with new proposed de-luxe material. Already before, a run from Warsaw to Far East had been studied, but all these dreams ended with World War I. Building the huge Yalu bridge, Japan established the link with Korea. 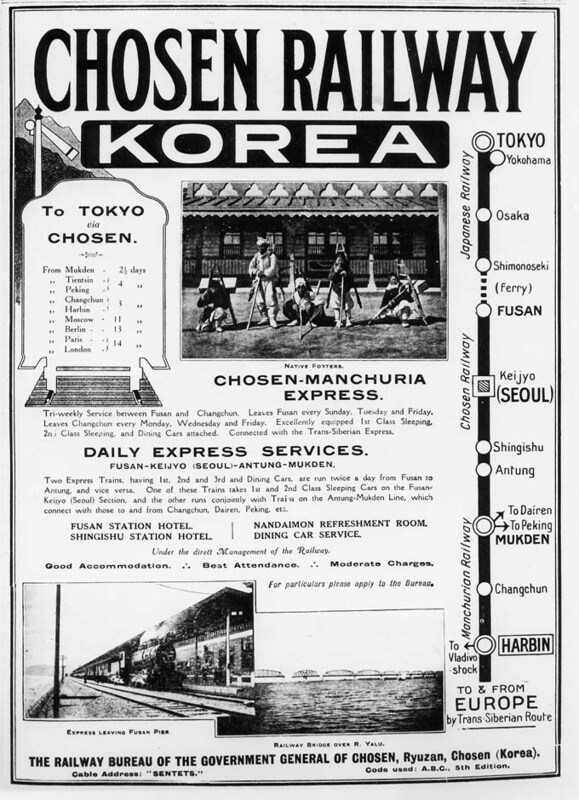 In 1912 the Japanese introduced a luxurious express Changchun - Busan (Fusan) in occupied Korea, with ferry connection to Shimonoseki and from there the Shimonoseki-Shimbashi Special to Tokyo. An advertisement of December 1913 described that Chosen-Manchuria Express as a tri-weekly service between Fusan Pier (Busan) and Changchun, "excellently equipped" with 1st class and 2nd class sleeping cars and a diner. 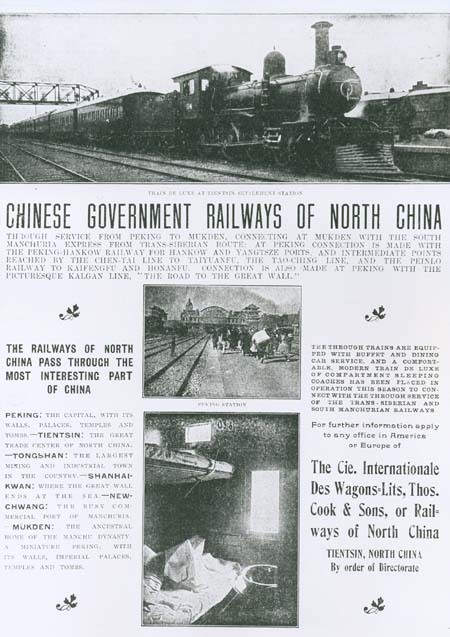 The railway administrations mentioned were the Chosen Railway and the Manchurian Railway. 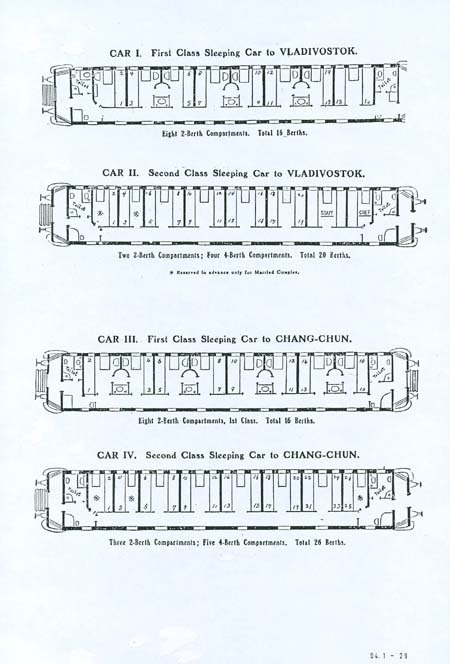 A report by H. Caren, published by Railway Magazine, described the acquisition of steam locomotives and Pullman cars in America, regardless the cost, and the train consisting of long carriages finished in dark green and gold, hauled by a Pacific engine. Even when traffic from Europe was stopped by World War I, the exclusive express continued running, in 1916 reduced to a once-weekly service, and only after December 31, 1916 it was withdrawn. The report by H. Caren continued with the personal experience of a travel from Pyongyang back to Japan in that year: "Just before 3 p.m., and sharp on time, the train rolled smoothly into the platform and came to a dignified stop. As I had been led to anticipate, everything was perfectly spick and span, from the great locomotive through the line of five absolutely uniform carriages in their green and gold finish, and the many smartly uniformed attendants. As there were some minutes to spare, I walked the length of the train along the platform and it was only then I realized that I was the only passenger. The time of departure approached and the station-master stepped out of his office, came up to me and saluted, and asked if I would kindly entrain. He was followed by the Chef-de-Train, who also saluted and escorted me to the door of my sleeping car. A boy then led me down a softly-carpeted corridor and ushered me into a beautifully-furnished compartment, which he informed me was my sitting-room, and indicated that the adjoining one was my bedroom; then he bowed low and left me... Tea appeared to be indicated so I strolled along more carpeted corridors until I reached the dining car, which I found to be a flawless symphony of ivory white ceiling, large plate-glass windows, beautiful paneling, and perfect table appointments. Here I had a choice of 24 seats, with four waiters to serve me...". On alternate days on the same timetable once-weekly State train Moscow - Irkutsk, once-weekly Kurier St. Petersburg - Irkutsk (including CIWL sleeper) connecting train Irkutsk - Vladivostok/ Changchun ("controlled by CIWL"), connection tri-weekly Manchuria-Chosen Express Changchun - Busan Pier, tri-weekly "Through Service" Mukden - Beijing. Cars state-owned, metal-covered, colors not known. 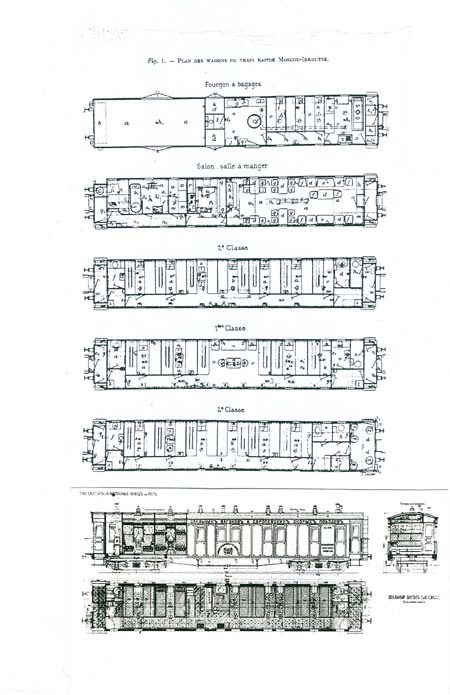 In 1900 CIWL showed at Paris exhibition a sumptuous "Transiberien" de-Luxe with cars 722-725, which never started. CIWL suffered severe financial problems. 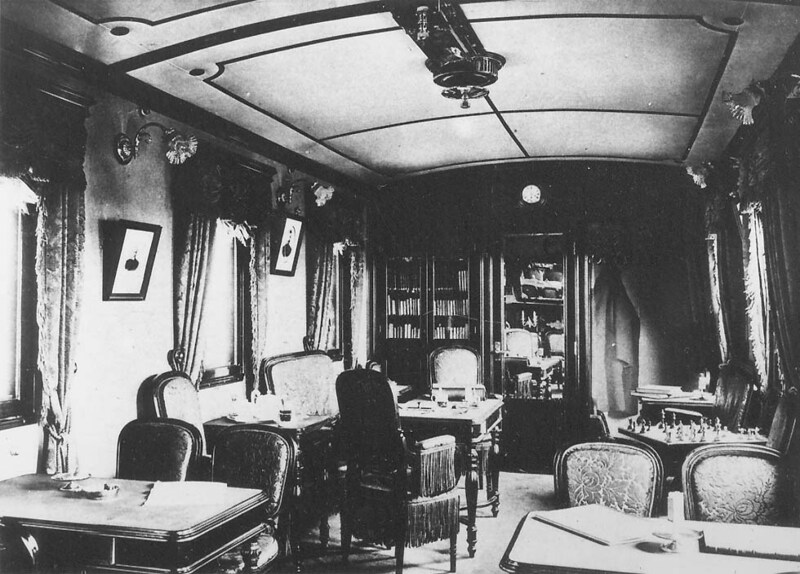 For 1905 a Siberien de-Luxe 1st class had been planned. 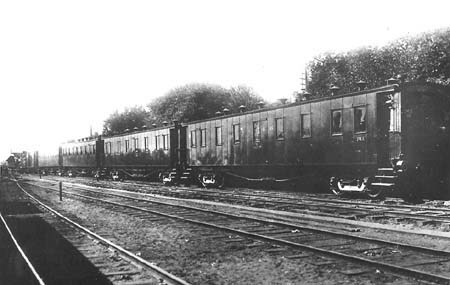 In 1913 CIWL ordered 12 WS (salon-observatoire) for a "Transsiberien de grand luxe" Warsaw-Moscow-Changchun/ Vladivostok, but the project was stopped due to WWI. A contract for services Yingkou (Newchwang) - Beijing had been stopped in 1903, when WL221 (with Pullman type sections) was sent through Siberia. Negotiations with Japanese authorities for CIWL services in Korea (not Japan!) brought no results. In 1918 all CIWL cars were requisitioned, as far as they had not escaped to the Baltics, Finland and the Far East. For CIWL in Russia, Philip Jeffort (CIWLT) mentioned 254 cars, including 10 standard gauge ones. Together with all cars from the beginning, the total number must have been higher. Freight engines also hauled express passenger trains, e.g. E (0-10-0), Ye (2-10-0 from America) in Siberia, on Chinese Eastern, in Far East, Mongolia, O (0-8-0) hauled the first Siberien-Express, Ts (2-8-0) on Chinese Eastern. 2-10-2 tank engines from Skoda on the Khingan mountain section in Manchuria. Busan - Changchun, tri-weekly, departure Busan Pier obviously with a Baldwin tenwheeler, 2 vans, 3 sleepers Busan - Changchun and (according to Railway Magazine) a diner Busan - Shenyang (Mukden), at Shenyang combined with 3 sleepers, a diner and a van Dalian - Changchun (not mentioned in the advertisement of Dec. 1913, according to Railway Magazine running from 1908).